Section of my painting with palette strokes and brush strokes. DID Van Gogh load his brush? Most assume he didn't–but used the standard technique of picking up paint directly from the palette (watch how to load a brush here). I suspect he used ample amounts of paint to more easily get broken color on his brush and onto his canvas (small piles of paint lead to cramped, tight painting with monochromatic strokes). Fellow painter Erik te Kamp went to the Kröller-Müller Museum in the Netherlands and took several close-up photos of Van Gogh's work. Erik noted that the paintings are over 125 years old and some passages look a little transparent. 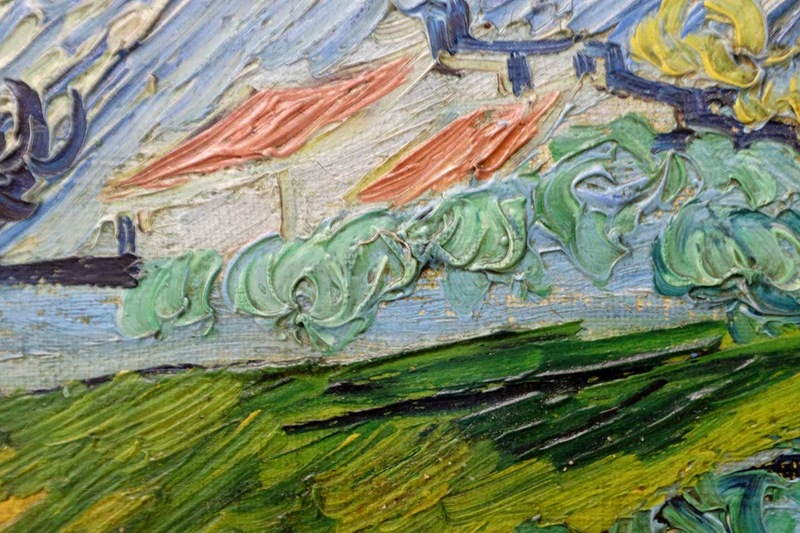 Because Van Gogh never varnished his paintings you can see an accumulation of dirt in the paint strokes (learn how new methods improve varnishing for modern painters here). What follows is an analysis of Van Gogh's technique. I start with a close-up of a recent painting of mine for contrast (since I know which strokes are brush or palette knife marks with absolute certainty). You can clearly see both palette knife and brush marks in my painting. 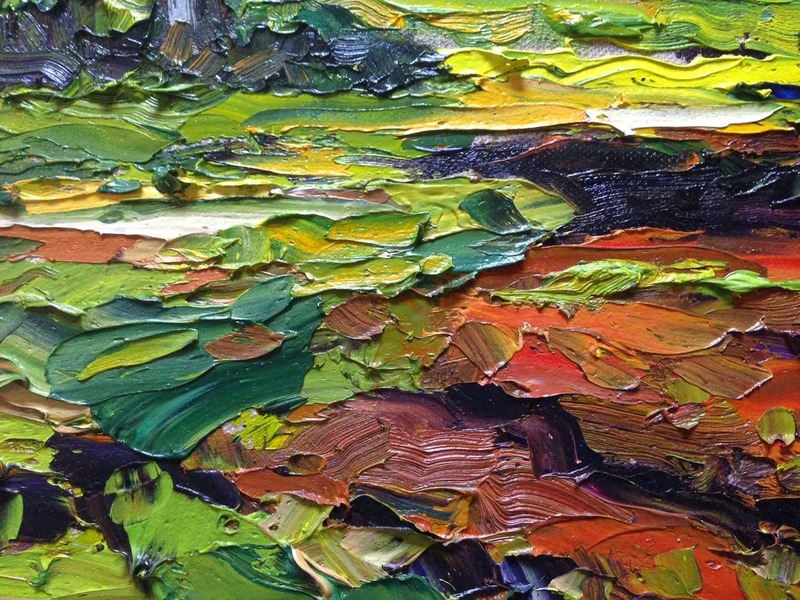 The principal example of a palette knife mark is the dark green stroke in the southwest quadrant. The most visible brush strokes are the purple-brown marks in the center lower half. Click images twice to see a larger view and use the back arrow to return. 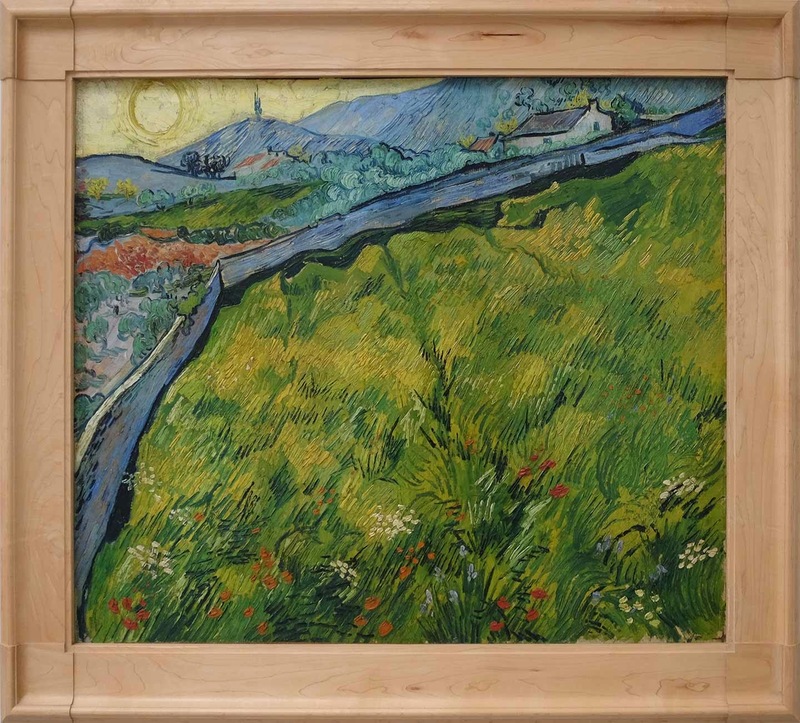 The next image–courtesy of Eric te Kamp and the Kröller-Müller Museum–is a painting by Van Gogh entitled Green Field. (Incidentally, I love the maple frame. I compliment the museum on such an apropos presentation). The next image is a close-up of the distant horizon. We see two flecks of red representing the tiled roofs of distant houses. There is evidence of brush marks and palette knife marks. Marks from the brush's bristles can clearly be seen in the green section. The light bluish-green vegetation in front of the houses appears to be made with a narrow, flat-ended palette knife–most notably in the stroke just right of center. This was completely unexpected, but further close-ups suggest he used both brushes and palette knives. The following image–an extreme close-up of the strokes of grass–confirms the claim. Note the hard edges on the upper sides of the central yellow strokes. In the following image—where you see dabs of color representing flowers —some dabs have brush marks and some don't. This is an example of Van Gogh painting with paint rather than with the brush. Meaning that so much paint was on his brush that no bristle marks were impressed into the resulting strokes. There is controversy about whether Van Gogh was right or left handed. I guess from this painting that he was right handed. Van Gogh was a bold painter, and the grass strokes would have been less consistent if he were holding the brush in his left hand. This is also corroborated by several self-portraits of Van Gogh holding the palette in the right hand. Which would have been reversed since he would have been looking into a mirror to paint his portrait. It is possible that he used his left hand for palette knife work but I see no evidence of that. Portraits of Vincent also show that he used generous amounts of paint on his palette. Which is good practice if you want to have lots of broken color in your paintings. Many thanks to Erik te Kamp for the fascinating close-ups of Van Gogh's work. He sent me more images, and I will analyze them in future blog entries. If anyone is close to a museum featuring paintings of J. M. W. Turner and would be willing to take similar photos, I would love to do a similar analysis of his work. Many thanks in advance for your help. Painting with paint. I like it. I've heard that some artists sculpt more than use the brush to lay down brush strokes. I can't afford to paint that thick myself. But seeing Van Gogh's work in person, he really did lay it on quite nicely! And it's not just the thickness, but the directional nature of the application to support the design. He's one of my favorites. I wonder if it was poisoning (lead) that was the root of his mental issues in the end. BTW...it seems as if all my artist friends on my blogs have just disappeared. It's like they just fell of the face of the earth. (I"m not talking about you). But I wonder if some artists have gotten so discouraged at the lackluster market that they've just given up or put art away for a while. THoughts? Some have speculated that lead poisoning contributed t his ailment but many think it was a type of epilepsy that he had. Not sure if the jury is out on that yet. I do know that the art market had not revived. Many are looking for alternative ways to make a living. A few have become essentially life coaches which is not a good sign. I think I get more art life coaching solicitations on twitter as I do from actual artists. I have considered slacking off on the blog a bit. Mostly because I have less to say these days. I would still like to get a good camera though! :) That could get me going again. I have two shows in November and I am worried about sales. It seems like putting a lot of eggs in one basket. I will report via this blog. Stay in touch! Good luck, Brad. I wish you the best at the shows. Let me know if you do get a good camera! would love to know what you pick up! (I'm expecting my new iPhone 6+ in a couple weeks. HOpe to make a couple videos myself! Good luck! Wish you the best of sales at the November show! I'm actually thinking of getting an iPhone 6 too. But at this point I am not sure if it has enough features for really great video. Let me know how your camera seems.